We are located in the Wet Mountains 20 miles to the southwest of Pueblo, Colorado. "We're the school that goes outside!" 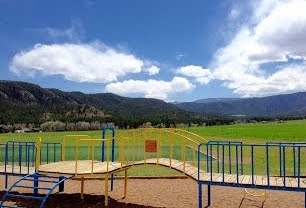 We are in Beulah, Colorado, which is located in the Wet Mountains, 20 miles to the southwest of Pueblo, Colorado. We call ourselves a Natural Sciences School. To us that means we try to integrate environmental awareness into our studies and activities wherever reasonable and wherever possible as part of our daily routine. Our students spend a lot of time outside learning and exploring nature in a variety of ways. They go into the local countryside on walking field trips, and nature hikes quite often. Our middle school students have at least two camp outs every year. These are a blast! 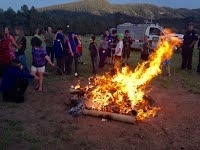 We set up tents on the playground, build a bonfire, and play outside in the cool mountain air. We have a full-time science teacher who works with all of our students nearly every day in our well-equipped science lab. 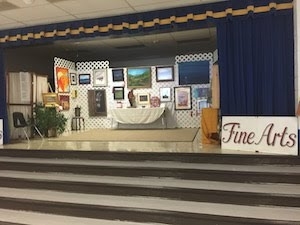 In the springtime, we have a school-wide Eco-Fair during which our school spends several weeks studying specific biomes, and creating projects for an Open House. We send students to the Pueblo District 70 Middle School Science Fair. We send students to the Colorado Science and Engineering Regional Fair competition, and from there, our students often advance to the State Finals. We take numerous trips every year to places like the Pueblo Mountain Park, the Pueblo Zoo, the Nature and Raptor Center, Lake Pueblo, The CSU-P Challenge Course, the Ag-Fest, Bent's Fort and many others. 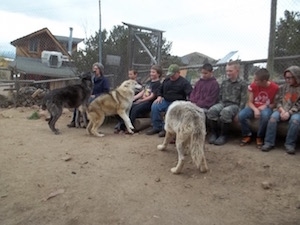 Our trips include activities like snowshoeing, kayaking, mountain biking, caring for rescued wolves, visiting a farm with newly born goats, fishing trips. We send students to River Watch annually so that they can learn to conduct water quality tests of local tributaries for Colorado State reporting. We are adding more all the time! 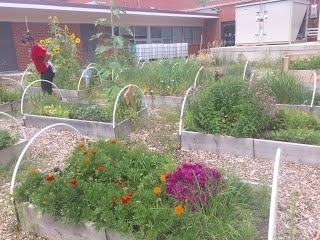 We have a school garden that our teachers use to teach biology, gardening, life cycles, and more to our students in grades kindergarten - 8. In the autumn, we bring the food inside and use it for lunch and snack times. Last year, we brought our fresh ingredients inside and made pizzas! We practice conservation and stewardship with school wide activities like our Lorax Club. They meet weekly to educate themselves, to guide school wide practices of reuse, repurpose and conservation. Breakfast and lunch scraps from our cafeteria go to local pigs while all containers are sorted and cleaned for recycling and terracycling. Students also consolidate school wide recycling containers for the community recycling program sponsored by BEST. 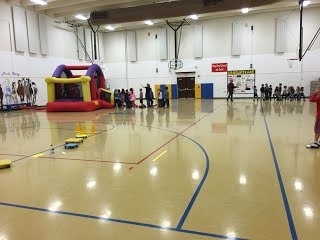 Beulah School believes that active children are healthy students. Our elementary students have two recess times per day, and they spend most of these outdoors on our beautiful playground. They also receive a structured physical education class every other day. Our middle school students receive physical education classes every single day. We are also a school that is rich in art experiences with a new art studio. We offer Kindergarten through eighth grade students rich instruction in visual arts, music, theater and dance. We are a two-year CAP Grant recipient for residency in dance with the Ormao Dance Company. We are also a three-year recipient of the Cherry Creek Arts Grant with our mini-gallery for student and professional art displays. 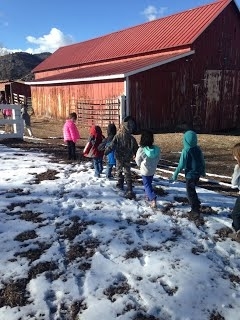 Our school is in a rustic setting in the small rural town of Beulah Colorado. 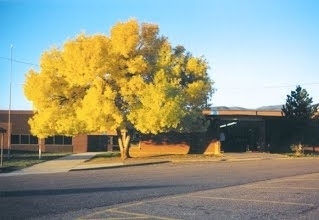 We offer busing directly to our school from a stop just outside of Pueblo. Call our office for more information about this service. One of the best things about our school is our student population. Our typical class size is under twenty students. This is a huge advantage for our students. 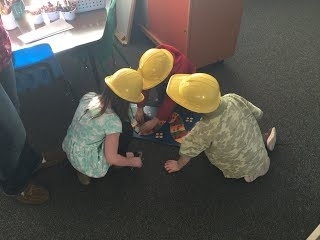 They receive more individualized attention and instruction from our staff of high quality, veteran teachers. We set high academic expectations for our students, and our student to staff ratio really pays off for us in this area. As part of Pueblo School District 70, we are on a four day per week calendar. In Beulah however, our school days are longer. This allows our students to spend more time going into depth on each area of study every school day. Another one of the benefits of being a kindergarten through eighth grade school is that we get to spend a lot of years together. This gives our students and staff a strong sense of community and belonging. During their time here with us, our students and their families become a part of our own extended family. Our rustic locale does not mean that we are cut off from the world completely. We are proud to have a fully functional computer lab, and three score of Apple iPads. Our students get plenty of experience using these devices as part of their daily routine. We also have a large library in our building. It has more books than many school libraries in much larger schools. This is because our school serves as a satellite branch of the Pueblo Library District. As such we receive all of the benefits and services available to any public library. 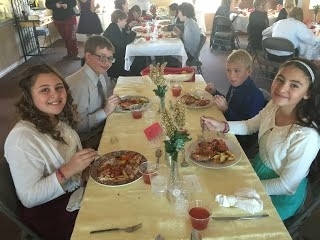 Just because we are a small school, don't think that we don't offer a full school experience to our sixth through eighth grade students Our middle school students have formal social events, dances and even learn etiquette at a catered, linen table dance where they practice ballroom dance skills as well. We have a student council that performs service projects around our school for the benefit of everyone. We are members of the National Junior Honor Society for our high achieving students. 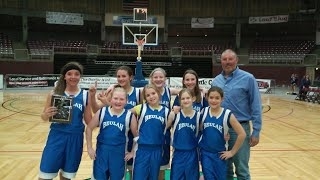 We offer a range of sports programs for our boys and girls as well-- and our teams do very well in the district leagues! We have a cross-country team, a volleyball team, boys and girls basketball teams, and a track team. Our boys have access to football as well thanks to Craver Middle School in Colorado City. All of our students benefit from our delicious breakfasts and lunches made in our own kitchen. There is a salad bar with fresh fruit and vegetables every day. We believe that students are better able to focus on the tasks we set before them if they are not distracted by anything, including being hungry. If you are looking to become involved around the school, we have two wonderful support organizations that depend on parent and community volunteers. Boosters is a parent organization that helps our teachers and classrooms with materials and supplies. They raise funds with concession sales at our sporting events, running our school carnival every fall, and holding a lap-a-thin for field trips. The Beulah Education Support Team (B.E.S.T.) is our other support organization. This non-profit organization runs community wide events like the Beulah Challenge Race, Do the Right Thing Recycling, and the Annual Beulah Chili Cook-Off. Their funding helps the school pay for programing, staffing, tutoring, and writing grants for projects that support our vision. Every school day we offer our BEST Care 4 Kids program which is sponsored by BEST. Under the guidance of our highly qualified director, children receive homework assistance, and get to participate in structured activities. On Fridays we offer enrichment classes such as cooking, theatre, art, story writing and gymnastics. During the summer, BEST Care 4 Kids also runs a week long STEAM (Science, Technology, Engineering, Arts and Math) Camp that is immensely popular. If you work, or just need help with child care, BEST Care 4 Kids is a wonderful option. We are immensely proud of our "little school in the mountains." We believe we have a lot to offer the children of Pueblo County. Check us out! We think you'll agree!